Here's my latest roundup of new Crochet Podcasts for your listening pleasure. Enjoy! 1. 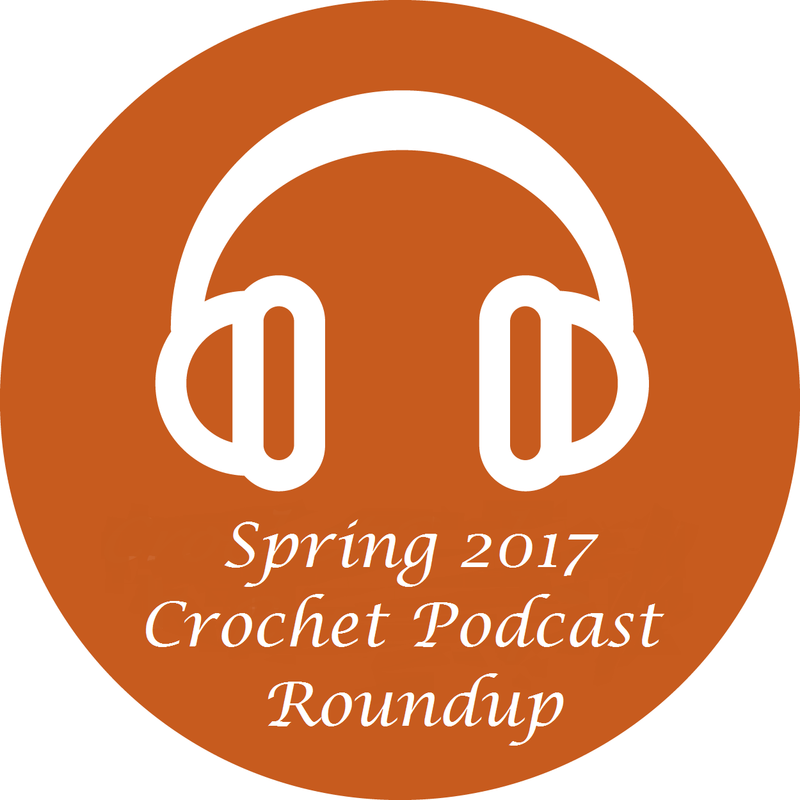 Crochet Luna is Claudia in California who started podcasting last month. She is kind of cheeky and makes me laugh a lot. She even contacted the Craft Yarn Council to ask why they don't have a 3mm hook. Hilarious! I found out about the very popular right now Hotel of Bees Crochetalong from this podcast and had to join in even though I'm now doing two shawl CALs at once and I do really have other hooky projects I should be getting on with. Here is Claudia's YouTube channel, Ravelry Group and she is @crochetluna on Instagram. I'm certain you'll like her! 3. B.Hooked Crochet is Brittany a fabulous crochet instructor and designer (among other things). She already has a host of marvellous instructional videos on YouTube but started a weekly audio podcast in February so she makes my new podcaster list. Sessions 2 through 8 cover Mastering Crochet Patterns. I'm playing catch up on these but I know they will be so helpful since from my three years of experience in teaching I know this is a big hurdle for many. Here is the link to Brittany's podcasts on her website and she is @bhooked on Instagram. Bonus: Yarn Thing with Marly Bird This is not a new podcast. Marly was in fact the first crochet podcaster on iTunes, ten years ago and I've been listening to her for the last five years but I'm including it because I was actually live on this podcast this week! Marly interviews famous knitters and crocheters on air every Tuesday and Thursday. Last week I wrote about wanting to win one of the CGOA CAL prizes, Karen Whooley's new book Garden of Shawls. Well, I was the call in winner!! I was so surprised I couldn't stop laughing. I'm around 44 minutes in but do listen to the whole interview. It's all good stuff mum. Watch on your iPad in the kitchen while you're doing chores and making dinner! Winning the book was such a surprise! Nice to hear about new podcasts. My network is slow with video so You Tube is not convenient. I like audio podcasts because I can listen while doing other things. Podcasts disappoint me when the content is good but the audio quality or production quality poor. Why go to the trouble of preparing the content if it can't be delivered properly? Podcast listening should be enjoyable and not a chore. As a radiophile I can't tolerate poor production - it makes me cringe. So I'm glad you have found some new podcasts to check out and I hope they make the grade! Thanks for taking the time to search and share your findings. I had given up looking...even though I love podcasts as a format. Good to hear from you Jodie! I realize now that I totally take my super speedy wifi for granted. And while I'm "watching" podcasters on YouTube I must admit I am mainly listening, like you, with the odd glance while I go about doing other things!! I am going to have to find some good audio podcasts now, just for you!! Have a wonderful week! Good to hear from you Nicole. You are going to love Marly. She is a really positive person and has such an infectious laugh. Enjoy!! Haha! I heard you on Marly's podcast last week. Good fun. I've been aware of Marly's podcast for years but tend to tune in to the guests I want to hear. I love her audience participation. She puts a lot of work into it. It's a big commitment and I admire Marly for that. Yes I'm the same Jodie with Marly's podcasts. If it's someone I want to hear I'll tune in. Marly works incredibly hard and like you I admire her A LOT. She's an inspiring lady!